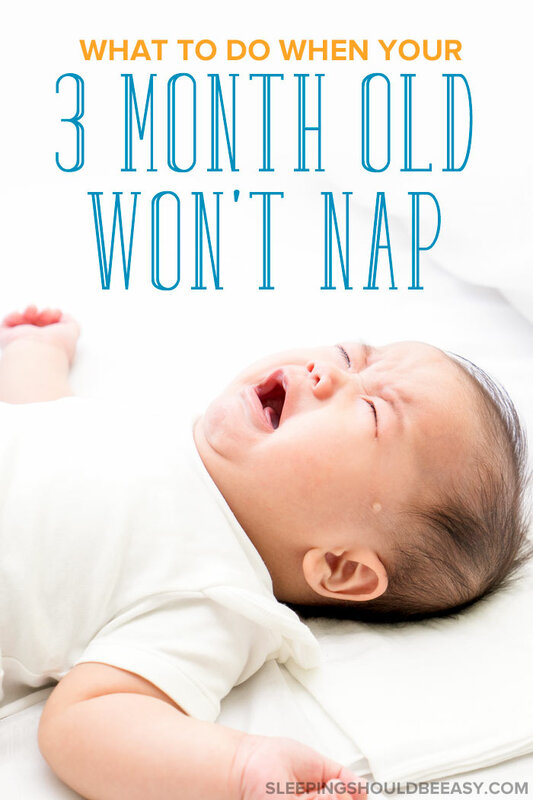 Your 3 month old won’t nap unless held, or can’t sleep in the crib or for longer than 30 minutes? Don’t worry: here are 6 secrets to get your baby to sleep! Naps had always been a nightmare, but after three months, it seemed to get even worse. Rocking my baby—especially on a yoga ball—would usually take five minutes before he’d get drowsy. But somewhere along the 3 month mark, even that didn’t work. Not only would rocking take much longer than five minutes, but rocking seemed to get him even more upset. Of course, the longer he stayed awake, the crankier he got, which only extended the cycle even more. And forget about putting him down—he wouldn’t settle for a nap if I wasn’t bouncing or walking around. I envied parents who could at least sit still on the couch with a sleeping baby. And once he did finally fall asleep, he’d wake up 15-20 minutes later, crying no less. I knew he was tired—I could see the baby tired signs like rubbing his eyes and getting cranky. He was fussy throughout the day, fighting even more naps, but I couldn’t carry him the whole time, either. Let’s just say I was fast losing my mind. I felt like a bad mom, as if I had “lost my touch” that only I seemed to have to get him to sleep. There’s something about naps that can make or break a mom’s day, don’t you think? We feel like we accomplished the biggest feat when we can get our babies to take long naps, but feel equally defeated when they won’t nap for more than 30 minutes. Perhaps you can relate. Maybe you used to be able to get your baby to nap with no issue, but now she screams and cries every time you try to put her to sleep. You have no idea how to get her to nap in the crib because she cries angrily the entire time. Maybe she’ll sleep after you carry and rock her in your arms, but wakes up the minute you lay her down. But you can only hold her for so long before your arms give out. No amount of picking her up or shushing seems to calm her down. And if you’re like most moms I know, this struggle leaves you in tears after every nap, feeling like a complete failure. Rest assured friend, you are not alone. I was also totally at a loss as to how to get my 3 month old to sleep. I know that feeling of having already gone through months of sleep deprivation and wondering how much longer you can take. That feeling of not knowing what to do. As much as a hit or miss naps can be, I found several tips I wish I knew about from the start. These “secrets” seemed to work far better than anything else I tried. Some of them even seemed backward or illogical, but proved themselves effective. As a first-time mom, I figured my baby would nap when he felt tired. After all, it seems to make sense: the more tired we are, the more we want to sleep. Unfortunately I learned, a bit too late, that babies don’t always fall asleep right when they need it. Sometimes we keep them up much longer than they should, which only makes for a cranky, fitful nap. And that in fact, a shorter wake time actually makes for better naps. So yes, rely on the sleep cues to see if your baby needs to nap, but pay attention to the clock, too. If it looks like he’s been awake long enough, start putting him down for a nap. I’m a huge fan of putting babies down drowsy but awake. I truly believe we need to give them the opportunity each nap time to fall asleep on their own (otherwise, how else will they learn?). That said, I also know how delirious it can get when you’re trying the same tactic over and over without it working. So, after you’ve tried putting your baby down drowsy but awake with no luck, do the opposite: put him down completely asleep. 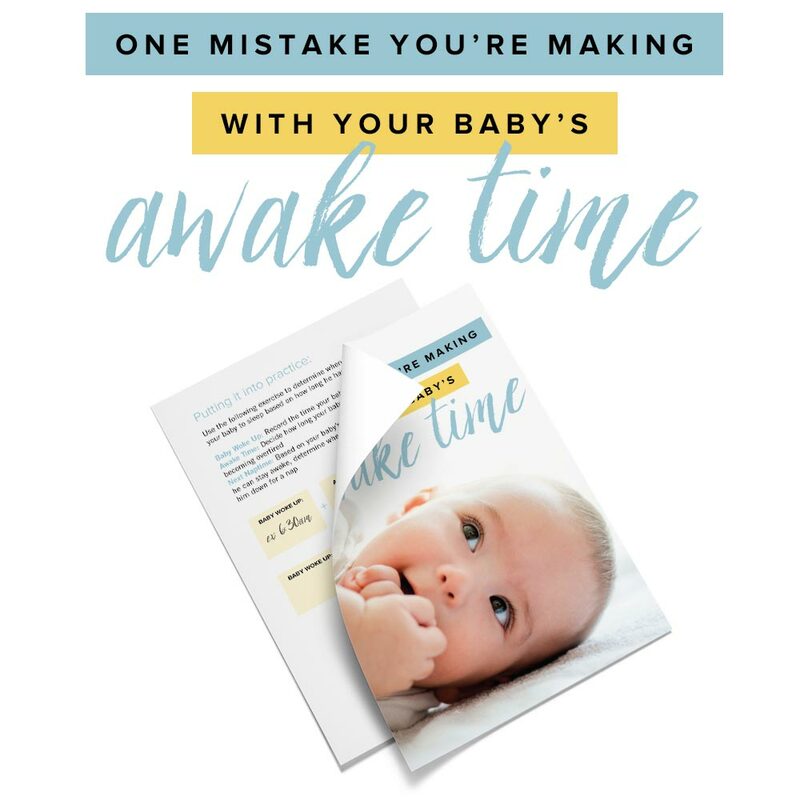 Except for many of us, we’ve dealt with the Dreaded Wake-Up—when the baby wakes up the minute we put him down. Even after we think he’s already asleep. The trick? Do the “arm test” to see if he’s really in deep sleep. Before you put your baby down, hold his hand up in the air and let it go. If it falls and flops back down, then he’s likely in deep sleep. If he pulls away, moves or squirms, then he’s not (and will likely wake up if you try to put him down). Do your baby’s naps always seem to end abruptly, even though you know she could have (and needs) more sleep? One trick that works wonders is to “tug” on her a pacifier. If she takes to sucking to soothe herself to sleep, a pacifier allows you to put her down and know she’ll sleep in a few minutes. The trouble is when she realizes she doesn’t have the pacifier in her mouth anymore, and can’t exactly reach out and put it back in. So, here’s what you do: a few minutes before she typically stirs and wakes up, give her pacifier a gentle tug. She’s likely coming out of deep sleep, and will automatically start sucking harder on her pacifier when she feels it coming loose. This extra sucking will then encourage her to sleep once again, perhaps even into a new sleep cycle. You’ve bought yourself more time and prevented her from waking up short from her nap. Get more tips on how to help your baby take longer naps. For many of us, feeding a baby to sleep can be a love-hate situation. We love that feeding almost always puts them to sleep, but hate that they rely on it to do so (especially when we know they’re not hungry). That was certainly my case—that is, until I stopped feeding my baby to sleep, but fed him after he woke up. This seems somewhat backward, especially when they fall asleep so quickly from feeding. But it’s exactly this reliance on feeding that makes it harder to get them to sleep any other way. Instead of feeding to sleep, feed your baby after she wakes up. That way, she doesn’t associate feeding with falling asleep. Plus, she’ll have fewer digestion issues when she isn’t asleep after having just eaten, and will have more energy when she’s awake. Swaddle: Your baby might be past the stage of the Moro reflex, or when her arms flail randomly. Still, it could help her sleep better with her arms tucked tight next to her in a swaddle. She’ll feel snug and comforted in a swaddle than simply lying with her arms outstretched. A Magic Sleepsuit also works for babies transitioning from a swaddle to having their arms free. White noise: The shushing, constant sound of a white noise machine can help muffle sounds that could startle her awake. A fan, heater, or audio sound can work just as well. Baby wrap or carrier: If your 3 month old won’t nap unless held, a baby wrap or carrier can be a good compromise. She’ll be able to stay close by and take a nap, while you still have your arms free. 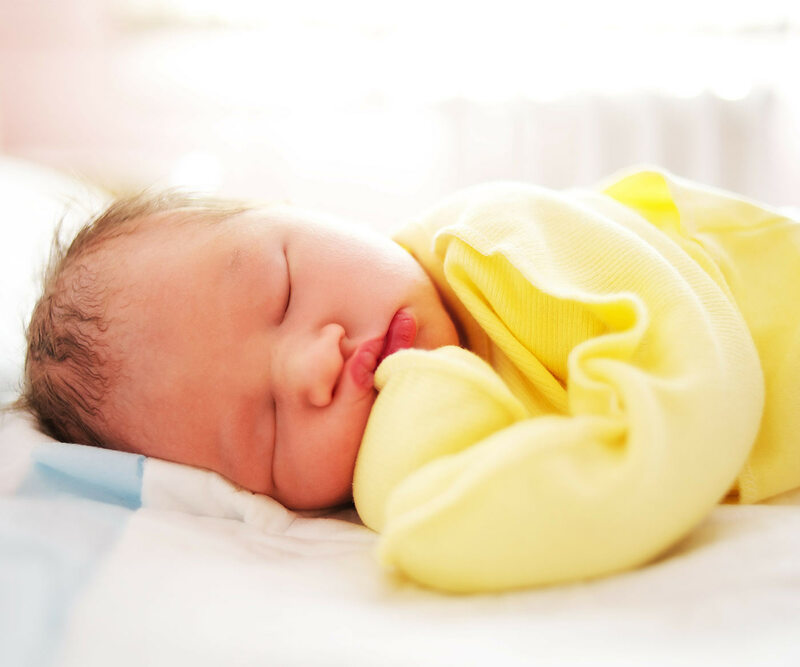 You might even be able to transition her from a baby wrap to another sleeping arrangement, like a swing or bassinet, when you start to see her stir. Routines help babies adjust to life outside the womb. As young as your baby might be, a daily routine can help her learn what to expect, from when to eat and of course, when to take a nap. Except a “by the clock” routine won’t work for babies. One nap can be as short as 20 minutes, while another can last for three hours. You can’t always put her down for a nap at 9am exactly every morning. Instead, follow a “flow” to your day, doing the same things in the same order every day. For instance, after waking up for the morning, you can feed before playing and keeping her awake. Then, start a simple nap routine, such as reading a few books, turning the room dark, and turning on the white noise. Doing the same things every time can help “signal” the coming of naps. Life can definitely feel frustrating when your 3 month old won’t nap. You hardly get a rest, doing chores is nearly impossible, and you feel stuck to your baby 24/7. Thankfully, these simple secrets can turn things around. 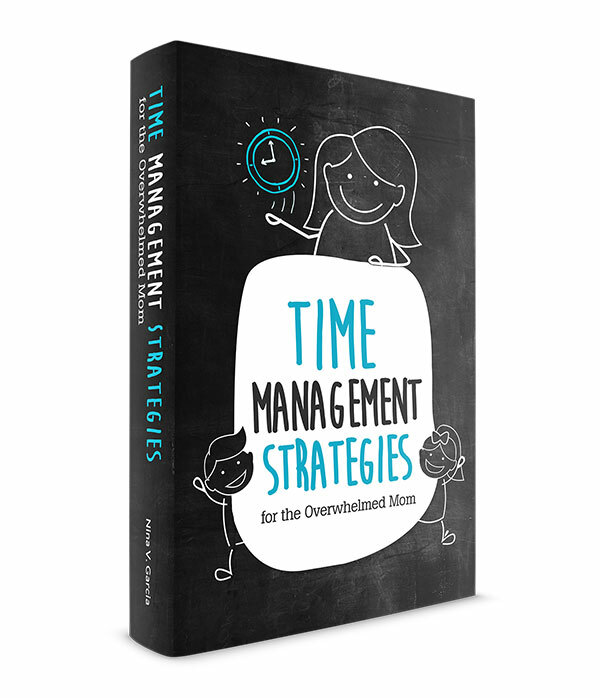 Prevent your baby from getting overtired by shortening her awake time to no more than 90 minutes max. If you can’t put her down drowsy but awake, make sure she’s completely asleep before setting her down. Try tugging on her pacifier before she typically wakes up, as this will hopefully buy you more time and stretch her sleep even more. Instead of feeding her to sleep, feed her after she wakes up, so she doesn’t rely on feeding sessions to fall asleep. Create a conducive sleep environment that will make her more likely to fall and stay asleep. Follow a routine, allowing the general “flow” of your day to signal what she can expect to happen next. And finally, I leave you with this: try not to get too frustrated with naps. I know, easier said than done, but sometimes we get so caught up in the moment we forget to ask ourselves whether this truly is worth the frustration. Instead, remember that whether your baby takes naps or not doesn’t define who you are as a parent. That this is a season in life that came and will surely go, as all seasons do. And that naps aren’t always the nightmare that they seem to be—even as you’re bouncing on that yoga ball for the zillionth time. Did you like this article about what to do when your 3 month old won’t nap? Share it on Pinterest and Facebook!